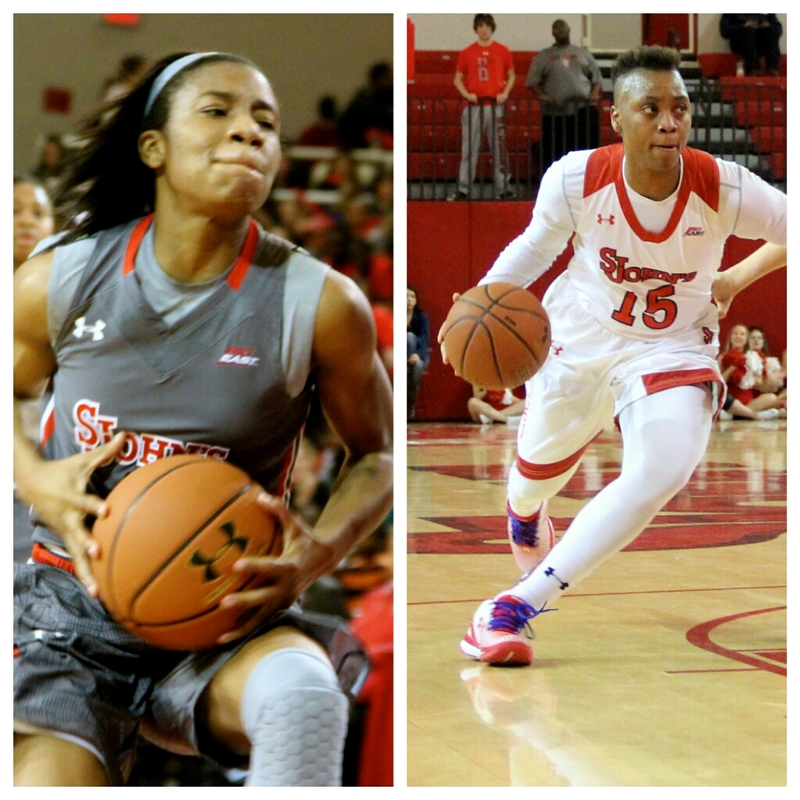 Following a 2014-15 campaign that saw the pair lead the Red Storm to the postseason for the eighth-consecutive year, Aliyyah Handford and Danaejah Grant have been honored by the Metropolitan Basketball Writers Association, earning spots on the All-Metropolitan First and Second Teams, respectively. The two juniors will be honored at the 82nd Annual All-Met NIT/MBWA Haggerty Award Dinner on Wednesday night at the Westchester Marriott in Tarrytown, N.Y.
At a combined 1,235 points on the season, the pair of junior guards joined to form the most productive single-season offensive duo in program history. Handford, a unanimous selection to the All-BIG EAST First Team for the second-consecutive season, also finds a spot on the All-Met First Team for the second-straight year. This is third career All-Met honor for the Newark, N.J., native, who took home All-Met Rookie of the Year accolades as a freshman following the 2012-13 season. This season, Handford put together one of the greatest campaigns in the history of St. John’s, tallying 655 points and leading the BIG EAST in scoring at 19.3 points per game. The junior’s point total was good enough for the second-highest single-season output in school history and helped propel her into seventh place on the school’s all-time scoring list (1,514 points), just 436 points shy of the top spot on the ledger. Handford also finished 10th in the BIG EAST in rebounding this season with 6.5 boards per contest. Grant, an All-BIG EAST Second Team selection, earns the first All-Met honor of her career after complete her first full season at St. John’s in 2014-15. The Piscataway, N.J., native netted 580 points on the year, good enough for the fifth-best single-season effort in program history. The junior guard finished fourth in the BIG EAST in scoring at 17.1 points per game in addition to topping the Red Storm in three-point field goals made and three-point field goal percentage.